England won their first encounter against the French in convincing fashion. The French had entered the international arena earlier in the year with a match against the New Zealand team (losing by a similar score) and a large crowd assembled at Parc des Princes to see the English side. The visitors had selected the same fifteen which had surprised critics a few days earlier by defeating a strong Scotland side – two players were unable to make the journey, however, and their places went to Hudson and Hogarth. Conditions were not ideal: though the ground was dry, a very strong wind ruined much of the handling and passing. According to one French historian, ‘le vent soufflait en ouragan’. And England started like a hurricane, forcing the French to adopt a defensive role. Hudson scored two early tries before Kewney scored in a dash for Cartwright to kick the first goal (his earlier attempts were wrecked by the wind). France recovered momentarily, showing pluck and better organisation, but after a rush by their forwards, Raphael gathered a loose ball and sped the length of the field. Shortly afterwards, Stoop scored and Cartwright kicked his second goal. The replacements, Hudson and Hogarth, scored the fifth and sixth tries and England were 22 points in charge at half-time. France gradually phased out the double ring motif to be replaced by the cockerel. 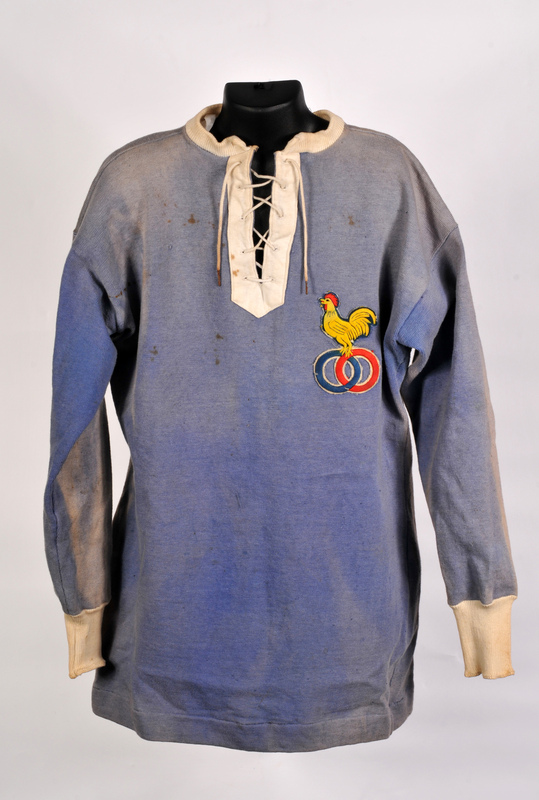 These briefly overlapped as shown in this 1911 jersey. France changed sides to play with the wind and immediately scored., Maclos sending Muhr in for a try which Branlat converted into a goal. Ten minutes of French pressure passed before Hudson crossed for his fourth try and Cartwright converted. France countered, and Lesieur, the French 100m and 400m champion, scored his nation’s second try. A fine run by Birkett led to England’s next try – by Peters – and Cartwright, now having allowed for the wind, was successful with his fourth conversion. Mills completed the scoring soon afterwards. About the Author – This is an extract from ‘The Book of English International Rugby 1871-1982’ by John Griffiths. John Griffiths is co-editor of the World Rugby Yearbook and the author of several books including ‘Rugby’s Greatest Characters’ available here. This entry was posted in England, France. Bookmark the permalink.